The Royal Automobile Club runs 52 squash leagues throughout the year as well as annual internal and external tournaments at both Pall Mall and Woodcote Park. The Club approached ClubSpark for an online solution to administer their leagues and tournaments and to provide the members with an easy way to contact their opponents, book courts and record their results online. ClubSpark developed the Competitions App to enable the coaching team to manage tournament entries, generate draws within minutes, give players the opportunity to submit results online and to receive email confirmation of who their next match opponent. Players who had previously been used to writing their result on the tournament draw sheet quickly got to grips with the online system. 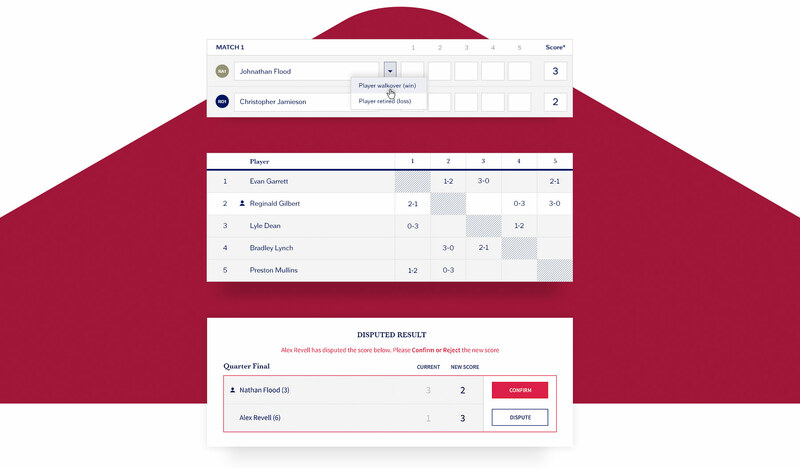 Linked with the court booking system, a player could contact their opponent and book a court online, then submit their result following the match. An advanced verification system ensured that both players had to agree the score and the result before it was submitted, triggering information to be sent to the winner detailing who they will play next and the date which the match needs to be played by. Finding an effective solution to put 52 Internal leagues with complex promotion and relegation rules online was a complex challenge. 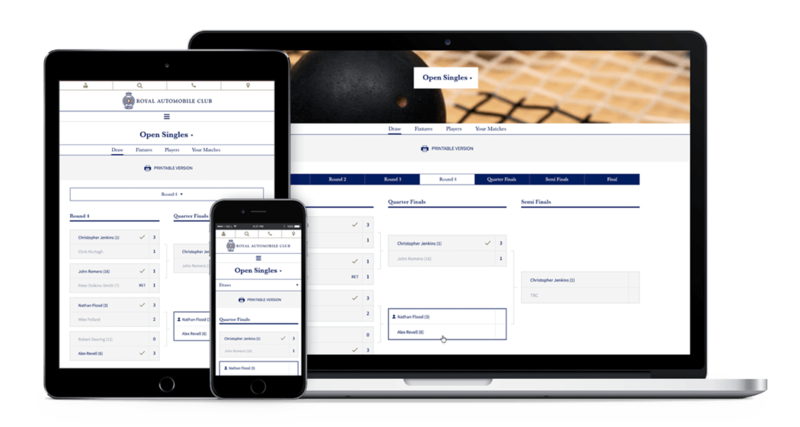 Working closely with the Squash Coaching and administration team, logic was developed to ensure the correct score parameters were established along with the support for complex rules around promotion and relegation accross leagues. The system must also allow the team to print branded, up-to-date printable sheets at anytime. An iPad has also been set up in an enclosure near the courts to allow members to check-in when they arrive. They can also view court bookings for other members to see which other members are in the building. This kiosk instantly took pressure off of the reception desk and relieved congestion in this area during peak periods. A display screen was also installed near the courts making it easy to see the court schedule and who is on court when. Creating each new league cycle used to take the squash pros countless hours – with the new online system it is done within a matter of minutes. The members are able to arrange their game, book courts and submit their results online, speeding up the process and providing a vastly improved user experience. Squash’s digital transformation at the Royal Automobile Club did not end there. As the administrators of England’s most prestigious inter club squash competitions, the Bath Club Cup, the Alma Cup and the Londonderry Cup, the Club wanted to bring an online solution to help reduce the hours of administration required to run the events. The ClubSpark platform has been developed to provide an easy to use online system accessible by all players to view fixtures, results and leagues standings, with permission granted to nominated Club Captains enabling them to submit team information and match results.